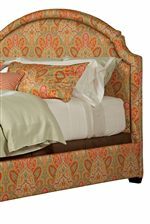 The Upholstered Beds Ashbury Queen Headboard by Kincaid Furniture at Story & Lee Furniture in the Leoma, Lawrenceburg TN and Florence, Athens, Decatur, Huntsville AL area. Product availability may vary. Contact us for the most current availability on this product.